Taking photos from great heights is all the rage these days. Which makes sense, given how easy it now is to get your hands on a camera-equipped drone, or commandeer a satellite. But after seeing this photo of Edinburgh, taken by Alfred Buckham around 1920, we’re not sure there’s much need to keep snapping. 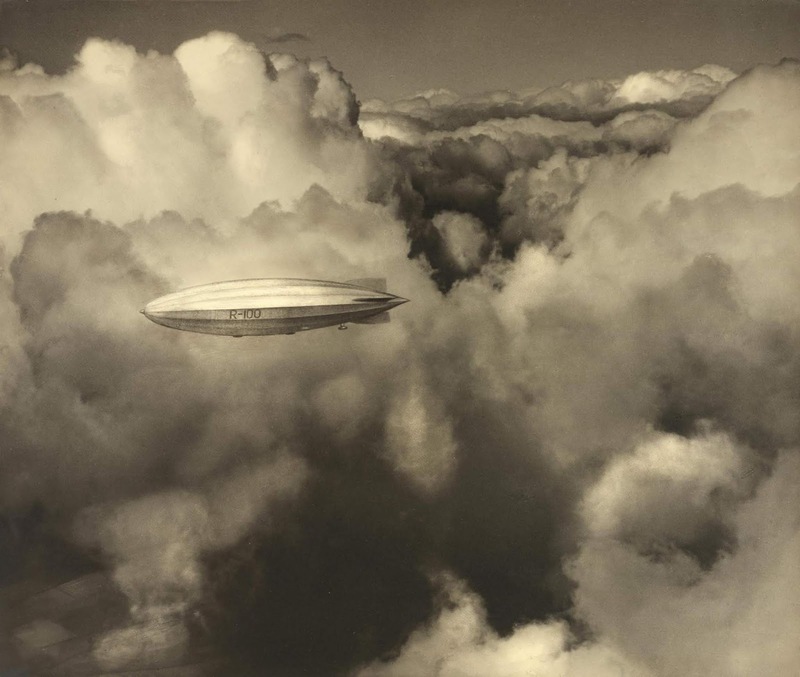 Put your lens caps on, pilots: the most majestic aerial photo was taken nearly a century ago! 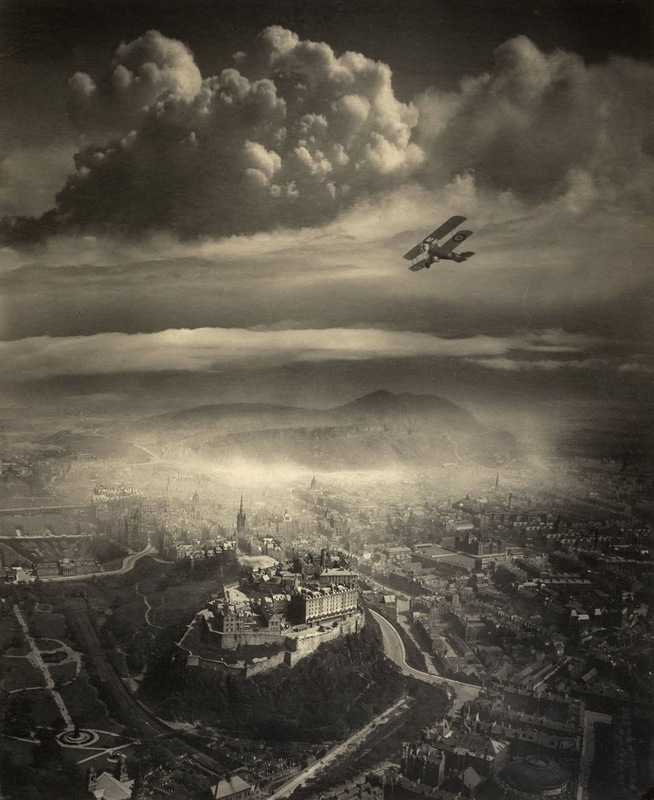 Alfred G. Buckham, Aerial View over Edinburgh, c. 1920, courtesy of the Scottish National Portrait Gallery. From the earliest days of manned flight, photographers sought to capture the strange and unfamiliar beauty of the view from above. Whether it was from balloons, airships or later, fixed-wing aircraft, enterprising pioneers overcame formida­ble technical obstacles to create striking new images of the world below. It was, however, through warfare in the twentieth century that aerial photography came to prominence. Alfred Buckham’s remarkable body of work in the air had its origins in a brief, eventful career with the Royal Navy in the last phase of the First World War, but he was also able to develop a highly personal approach that combined his skills in documentary reconnaissance with an artist’s feeling for mood and atmosphere. Born in London, Buckham’s first ambition was to become a painter but after seeing an exhibition of work by J.M.W. Turner at the National Gallery he apparently destroyed all his own work. He turned instead to photography and in 1917 was enlisted into the photographic division of the Royal Navy. He was stationed first at Turnhouse near Edinburgh and was later transferred to the Grand Fleet based at Rosyth on the Firth of Forth. On his missions he took two cameras, one for his technical photography for the Navy and the other for personal use. Flying over Scotland he took numerous photographs of cloud formations, hilly landscapes and views of towns, often seeking out extremes of weather to add drama to his subject matter. Buckham’s aerial view of Edinburgh has become one of the most popular photographs. The view is taken from the west, with the castle in the foreground and the buildings of the Old Town along the Royal Mile gradually fading into a bank of mist with the rocky silhouette of Arthur’s Seat just visible in the distance. 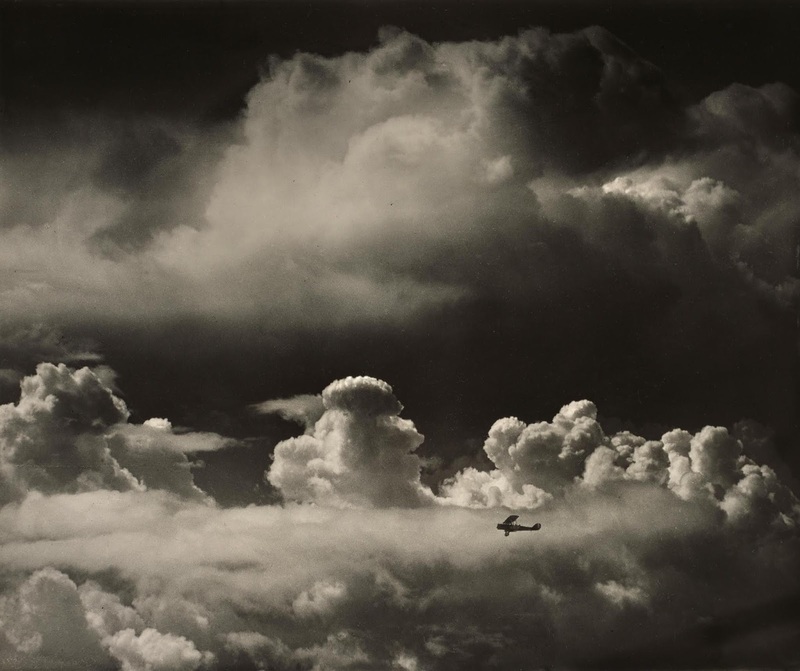 Buckham was always keen to capture strong contrasts of light and dark, often combining the skies and landscapes from separate photographs to achieve a theatrical effect. As he does here, he some­times collaged or hand-painted the form of a tiny aircraft to enhance the vertiginous effect. Yet accuracy remained a concern; Buckham later professed a particular fond­ness for his view of Edinburgh, ‘because it presents, so nearly, the effect that I saw’. In the early days of flight, aerial recon­naissance was a hazardous task. Buckham crashed nine times and in 1919 was discharged out of the Royal Navy as one hundred per cent disabled. However, he continued to practise aerial photography through the 1920s, and in 1931 he travelled to Central and South America to take photographs for an American magazine, a commission that resulted in a remarkable series of views of mountain ranges and snow-rimmed volcanoes. In his journals and in various magazine articles, Buckham conveyed a spirit of adventure and derring-do that is not for the faint-hearted or those with a fear of flying. Alfred G. Buckham, Cloud Turrets, c. 1920, courtesy of the Scottish National Portrait Gallery. 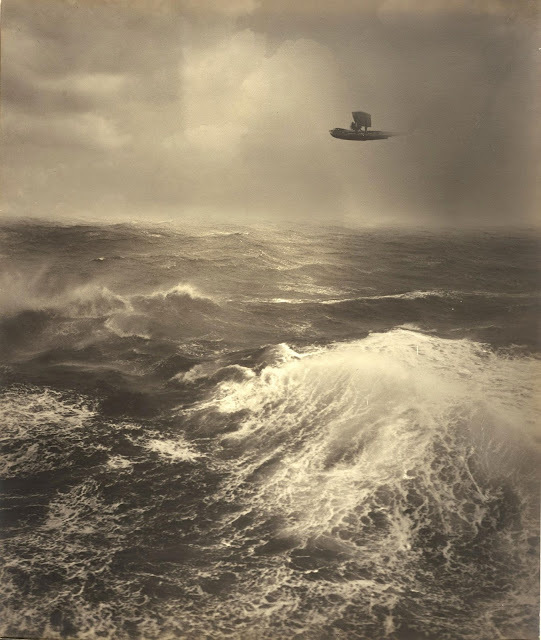 Alfred G. Buckham, Flying Boat over Sea, c. 1920, courtesy of the Scottish National Portrait Gallery. Alfred G. Buckham, R100, c. 1920, courtesy of the Scottish National Portrait Gallery. 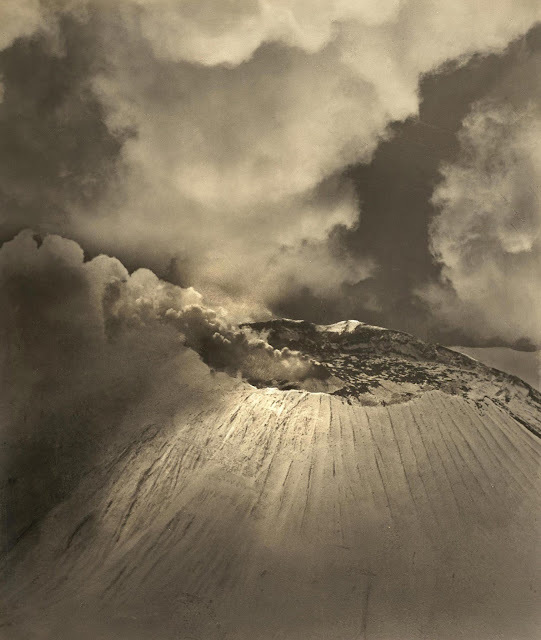 Alfred G. Buckham, Volcano. Crater of Popocatetl c. 1930, courtesy of the Scottish National Portrait Gallery.